Excessive fat intake contributes to the progression of metabolic diseases via cellular injury and inflammation, a process termed lipotoxicity. Here, we investigated the role of lysosomal dysfunction and impaired autophagic flux in the pathogenesis of lipotoxicity in the kidney. In mice, a high-fat diet (HFD) resulted in an accumulation of phospholipids in enlarged lysosomes within kidney proximal tubular cells (PTCs). In isolated PTCs treated with palmitic acid, autophagic degradation activity progressively stagnated in association with impaired lysosomal acidification and excessive lipid accumulation. Pulse-chase experiments revealed that the accumulated lipids originated from cellular membranes. In mice with induced PTC-specific ablation of autophagy, PTCs of HFD-mice exhibited greater accumulation of ubiquitin-positive protein aggregates normally removed by autophagy than did PTCs of mice fed a normal diet. Furthermore, HFD-mice had no capacity to augment autophagic activity upon another pathologic stress. Autophagy ablation also exaggerated HFD-induced mitochondrial dysfunction and inflammasome activation. 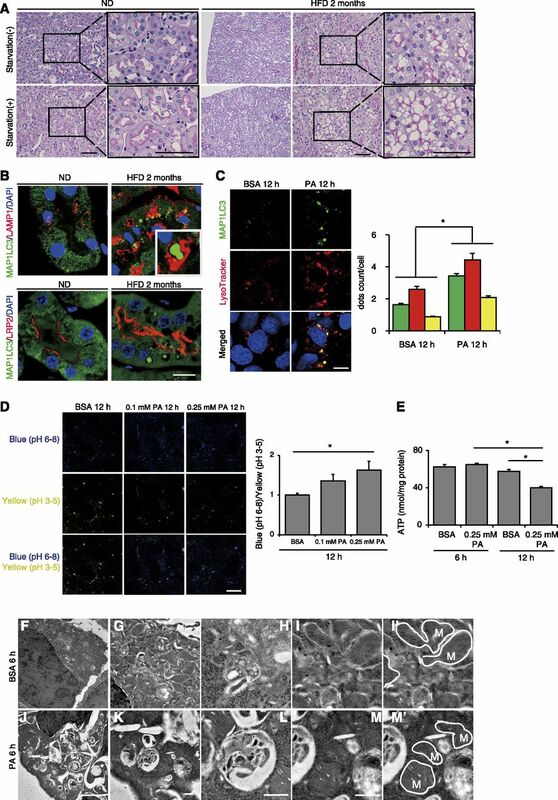 Moreover, renal ischemia-reperfusion induced greater injury in HFD-mice than in mice fed a normal diet, and ablation of autophagy further exacerbated this effect. Finally, we detected similarly enhanced phospholipid accumulation in enlarged lysosomes and impaired autophagic flux in the kidneys of obese patients compared with nonobese patients. These findings provide key insights regarding the pathophysiology of lipotoxicity in the kidney and clues to a novel treatment for obesity-related kidney diseases. In the last several decades, the increased prevalence of obesity has been considered a serious health and economic burden worldwide.1 A growing body of evidence suggests that excess lipid intake induces cell injury and organ dysfunction (termed lipotoxicity).2,3 Lipotoxicity has been intensively studied in organs that have evolved specialized lipid handling functions, such as adipose tissue and liver. Although Moorhead proposed the hypothesis that lipid abnormalities contribute to the progression of kidney injury in 1982,4 and increasing evidence has supported the lipid nephrotoxicity hypothesis, studies on lipid metabolism in the kidney are scarce. The mitochondrial β-oxidation of free fatty acids (FFAs) is a major source of renal ATP production, particularly in proximal tubular cells (PTCs), which have a high energy demand.5–7 PTCs take up circulating FFAs dissociated from albumin through specific membrane proteins, such as fatty acid (FA) translocase (CD36) and FA-binding protein.8 In addition, PTCs retrieve albumin-bound FFAs from the glomerular filtrate by receptor-mediated albumin endocytosis. Autophagy is one of the major cellular degradation pathways, along with the ubiquitin–proteasome system.9–11 Recently, a close relationship between autophagic activity and lipid metabolism has been recognized. Firstly, lipid droplets are sequestered by autophagosomes and eventually broken down by lysosomes through a process termed lipophagy.12–14 Secondly, several saturated and unsaturated FFAs appear to modulate autophagic activity. For example, palmitic acid (PA) activates autophagy by downregulation of the mechanistic target of rapamycin (mTOR) signal15 or by the phosphorylation of the double-stranded RNA-dependent protein kinase c-Jun N-terminal kinases 1 pathway.16 Moreover, PA causes the disruption of inhibitory signal transducer and activator of transcription 3–RNA-dependent protein kinase interactions, which facilitates autophagy induction.17 In contrast, a high-fat diet (HFD) downregulates autophagy by reducing autophagosome/lysosome fusion,18 as well as by decreasing the number and the acidity of lysosomes.19 The conflicting results may be attributed to differences in cell types, observation period, FFAs concentration and, more likely, difficulty in monitoring autophagic flux in vivo. We have previously demonstrated that enhanced autophagic activity in the kidney proximal tubules plays a protective role in several pathologic settings.20–24 More recently, we have established methods for monitoring autophagic activity in vivo.25 Given that autophagic activity can be downregulated by lipid overload, cellular functions may be jeopardized in pathologic settings in which properly enhanced autophagy should exert a compensatory or protective role. On the basis of this background information, we investigated (1) the pathophysiology of lipotoxicity in the PTCs with a focus on lysosomes and mitochondria, (2) lipid overload-mediated alterations in autophagic activity in vivo and in vitro, and (3) the effects of autophagy deficiency on kidney morphology and function during lipid overload. Eight-week-old mice were fed a normal diet (ND) or a HFD for 2 months (hereafter, referred to as nonobese and obese mice, respectively). Cytosolic vacuolar formation was induced in the PTCs of the cortex by HFD, but not by ND (Figure 1A). Twenty-four hours of starvation increased vacuole size in the PTC of obese mice, but not in nonobese mice. There were very few Oil Red O-positive vacuoles in the PTCs of both obese and nonobese mice, whereas 24 hours of starvation led to Oil Red O-positive lipid droplet formation, especially in nonobese mice (Supplemental Figure 1A). In contrast, almost all vacuoles in obese mice were positively stained with Nile red, which detects all neutral lipids, and with toluidine blue staining, which detects phospholipids (Supplemental Figure 1, B and C). Electron microscopy revealed that the vacuoles contain multilamellar, onion skin-like structures indicative of phospholipids in agreement with a previous report (Supplemental Figure 1, D–K).26 In addition, the margins of the vacuoles were immunostained with lysosomal-associated membrane protein 1 (LAMP1) (Supplemental Figure 1L). HFD contributes to phospholipid accumulation in the dysfunctional lysosomes of PTCs. (A) PAS-stained kidney cortical regions of nonobese or obese mice that were either fed or subjected to 24 hours of starvation (n=6–9 in each group). Magnified images are shown in the insets (original magnification, ×1000). (B) Kidney sections of nonobese and obese GFP-MAP1LC3 transgenic mice (n=6–9 in each group) were immunostained for LAMP1, a marker of lysosome, or LRP2/MEGALIN, a marker of proximal tubules (red), and counterstained with DAPI (blue). (C) PTCs isolated from wild-type mice stably expressing GFP-MAP1LC3 were stained with LysoTracker Red, and counterstained with DAPI (blue) after treatment with either 0.25% BSA or 0.25 mM PA for 12 hours (n=5). (D) PTCs were stained with the pH indicator LysoSensor Yellow/Blue after treatment with either 0.25% BSA or 0.25 mM PA for 12 hours (n=5). The blue/yellow ratio is presented (right). (E) Cellular ATP levels after treatment with either 0.25% BSA or 0.25 mM PA for 12 hours. (n=5). (F–M) Electron micrographs of PTCs treated with 0.25% BSA (F–I) or with 0.25 mM PA (J–M) (n=2). (M' and I') Outer mitochondrial membranes are traced (solid lines). Bars: 50 μm (A), 10 μm (B, C, and D), 5 μm (F and J), and 500 nm (G–I and K–M). Data are provided as mean±SEM. Statistically significant differences (*P<0.05) are indicated. All images are representative of multiple experiments. M, mitochondria. Inspired by the above observations, we postulated that HFD affects lysosomal machinery and/or autophagic degradation in the PTCs. Eight-week-old green fluorescent protein-conjugated microtubule-associated protein 1 light chain 3 (GFP-MAP1LC3) transgenic mice, in which GFP-positive puncta reflect autophagosomes,27 were fed a ND or a HFD for 2 months. We found lysosomal vacuoles containing GFP-positive phospholipid accumulation, which should not be observed in acidic environment (Figure 1B).28 We then treated cultured PTCs stably expressing GFP-MAP1LC3 with PA-bound BSA. Colocalization of GFP and LysoTracker Red was significantly increased in PA-treated PTCs compared with BSA-treated controls, suggesting impairment in lysosomal acidification (Figure 1C). Furthermore, we utilized the LysoSensor Yellow/Blue reagent, a pH-sensitive probe that emits predominantly yellow fluorescence in acidic organelles and blue fluorescence in less acidic organelles. Treatment of PTCs with PA significantly increased the blue/yellow ratio in the acidic vesicular organelles, reflecting an increase in pH (Figure 1D). We also found a time-dependent decrease in cellular ATP levels in PTCs treated with PA (Figure 1E). Electron microscopy analysis revealed a massive vacuolization containing undigested proteins and organelles, and degenerated mitochondria in the PTCs treated with PA (Figure 1, F–M). To investigate the origin of phospholipids and the role of autophagy in phospholipid accumulation, we performed an FA pulse-chase assay using phosphatidylcholine fluorescence-tagged at its FA tail (FL HPC) (Figure 2A). Cultured PTCs were initially labeled overnight with trace amounts of FL HPC, which is known to integrate into various cellular membranes, including the endoplasmic reticulum, mitochondria, and Golgi apparatus. Cultured PTCs chased with BSA treatment preserved the FL HPC signal in cellular membrane structures (Figure 2B). In contrast, the FL HPC signal on membranes was decreased in PA-treated PTCs. Colocalization of FL HPC and LysoTracker Red was significantly increased and enlarged in PA-treated PTCs compared with BSA-treated controls, indicative of PA-induced redistribution of phospholipids from cellular membranes into lysosomes (Figure 2B). The active involvement of autophagy in FL HPC transfer from cellular membranes was shown by immunostaining for MAP1LC3 and LAMP1 in autophagy-deficient and -competent cultured PTCs (Figure 2, C and D). Under PA treatment, FL HPC was occasionally found in autophagosomes in addition to lysosomes (Figure 2C). This FL HPC/autophagosome/lysosome colocalization was inhibited by autophagy deficiency (Figure 2D). PA treatment mobilizes phospholipids from cellular membranes via autophagy in the PTCs. (A) Schematic illustration of fluorescence FA pulse-chase assay. (A and B) FL-HPC loaded PTCs isolated from wild-type mice were chased after treatment with either 0.25% BSA or 0.25 mM PA for 6 hours (n=5), and the subcellular localization of FL-HPC was determined by staining with LysoTracker Red. To determine phospholipid accumulations in lysosomes, the number and size of merged dots were measured. (C and D) FL-HPC loaded autophagy-competent and -deficient PTCs were immunostained for MAP1LC3 (red) and LAMP1 (white), and counterstained with DAPI (blue) after treatment with either 0.25% BSA or 0.25 mM PA for 6 hours (n=3). Magnified images are shown in the insets (original magnification, ×7200). Bars: 10 μm. Data are provided as mean±SEM. Statistically significant differences (*P<0.05) are indicated. All images are representative of multiple experiments. Next, HFD-mediated changes in demand and activity of basal autophagy were evaluated in the recently established tamoxifen-inducible PTC-specific autophagy-deficient mice (Atg5F/F;N-myc downstream regulated gene 1 [NDRG1]).25,29 Eight-week-old mice (Atg5F/F;NDRG1 and Atg5F/F control mice) were fed a ND or HFD for 2 months. Three weeks before euthanasia, ND-fed nonobese control and HFD-induced obese mice received tamoxifen to induce genetic ablation of Atg5. The accumulation of SQSTM1/p62 and ubiquitin represents the amount of substrate requiring degradation that accumulated over the 3-week period, because SQSTM1/p62 is the ubiquitin- and MAP1LC3-binding protein that regulates the formation of protein aggregates and is removed by autophagy, thus serving as an index of autophagic degradation.30,31 Autophagy deficiency was confirmed (Supplemental Figure 2). PTCs of obese Atg5F/F;NDRG1 mice treated with tamoxifen exhibited mild cytosolic swelling compared with those of nonobese Atg5F/F;NDRG1 mice (Figure 3A). Moreover, 3-week ablation of autophagy triggered increased accumulation of SQSTM1/p62- and ubiquitin-positive protein aggregates in obese Atg5F/F;NDRG1 mice, indicating that obese mice utilize autophagy for the degradation of increasing substrates (Figure 3B). 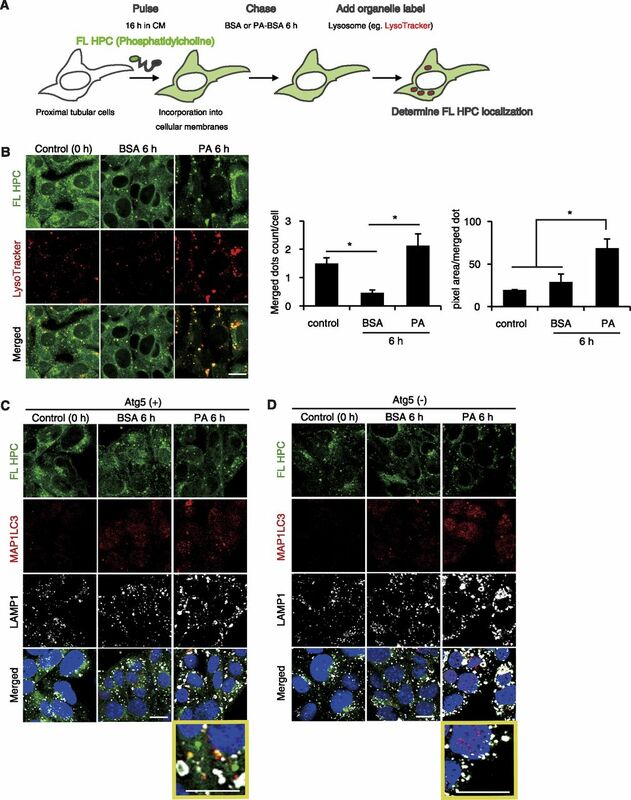 HFD induces autophagy dependency and alteration in autophagic flux in the PTCs. (A and B) The HFD-loaded kidney is more reliant on autophagy for the degradation of increased substrates (n=4–5 in each group). (A) PAS-stained kidney cortical regions of vehicle- or tamoxifen-treated nonobese and obese Atg5F/F and Atg5F/F;NDRG1 mice. (A, i and ii) Magnified images from tamoxifen-treated nonobese and obese Atg5F/F;NDRG1 mice are presented (original magnification, ×1000). (B) Kidney cortical regions of nonobese and obese Atg5F/F and Atg5F/F;NDRG1 mice were immunostained for SQSTM1/p62 and ubiquitin after treatment with vehicle or tamoxifen 3 weeks before euthanasia. Magnified images (original magnification, ×1600) from tamoxifen-treated Atg5F/F;NDRG1 mice are presented. The number of SQSTM1/p62- or ubiquitin-positive dots was counted in at least ten high-power fields (original magnification, ×400). (C and D) GFP-positive puncta formation was assessed in the proximal tubules of nonobese or obese GFP-MAP1LC3 transgenic mice that were either fed or subjected to 24 hours of starvation, with or without chloroquine administration 6 hours before euthanasia (n=6–9 in each group). (C) Kidney sections were immunostained for LRP2/MEGALIN, a marker of proximal tubules (red), and counterstained with DAPI (blue). (D) The number of GFP-positive puncta per proximal tubule under each condition was counted in at least ten high-power fields (original magnification, ×600) (each high-power field contained 10–15 proximal tubules). Bars: 50 μm (A) and 10 μm (B and C). Data are provided as mean±SEM. Statistically significant differences (*P<0.05) are indicated. All images are representative of multiple experiments. F/F, Atg5F/F mice; F/F:NDRG1, Atg5F/F;NDRG1 mice. To assess HFD-mediated alterations in autophagic flux, GFP-MAP1LC3 transgenic mice were administered chloroquine 6 hours before euthanasia. GFP-positive puncta were rarely observed in the fed, chloroquine-free nonobese mice, whereas a substantial number of GFP-positive puncta were observed in the LRP2/MEGALIN-positive PTCs of the fed, chloroquine-free obese mice (Figure 3, C and D). Chloroquine administration significantly increased the number of GFP-positive puncta in obese mice, whereas the number of puncta remained unchanged in nonobese mice, suggesting high basal autophagic activity in obese mice and low basal autophagy in nonobese mice. Next, autophagic flux was assessed in response to 24 hours of starvation. Chloroquine administration significantly increased GFP-positive puncta in starved nonobese mice, whereas the increase was blunted in obese mice (Figure 3, C and D). Western blot analysis (MAP1LC3, SQSTM1/p62, and ubiquitinated proteins) using whole kidney lysates roughly confirmed this fluorescence study (Supplemental Figure 2, B and C). Overall, these results demonstrate that the PTCs in nonobese mice exhibit low basal autophagic activity and high starvation-induced autophagic flux, whereas those in obese mice exhibit high basal autophagic flux and stagnated autophagic flux by starvation. We next investigated the effects of PA overload on autophagic activity in cultured PTCs. BSA treatment promoted the conversion of MAP1LC3-I to MAP1LC3-II, which was augmented in the presence of bafilomycin A1 at all indicated times (Supplemental Figure 3A). Consistently, BSA treatment increased the degradation of SQSTM1/p62 protein in a time-dependent manner, as shown by the reduction of SQSTM1/p62 turnover index (defined as the proportion of the levels of SQSTM1/p62 of the indicated sample to the levels of SQSTM1/p62 of the untreated controls at the baseline), indicating BSA-induced upregulation of autophagic flux, as decreased SQSTM1/p62 protein levels are associated with autophagy activation (Supplemental Figure 3B). In contrast, PA treatment strongly increased the conversion of MAP1LC3-I to MAP1LC3-II with no additional increase in MAP1LC3-II observed in the presence of bafilomycin A1 (Supplemental Figure 3A). Consistently, PA treatment significantly increased the degradation of SQSTM1/p62 protein at early stages (3 hours), and thereafter, a significant rebound at a late stage was observed (12 hours) (Supplemental Figure 3B). The PA-induced rebound of the SQSTM1/p62 turnover index was presumably because of the downstream suppression of autophagic flux, as SQSTM1/p62 mRNA expression was unchanged (Supplemental Figure 3C). To determine the role of autophagy during lipid overload, we exposed autophagy-deficient and -competent cells to PA or BSA. The mitochondrial membrane potential, assessed by tetramethylrhodamine ethyl ester (TMRE), was significantly reduced in both cell lines with PA treatment compared with those with BSA; however, the reduction was more prominent in autophagy-deficient PTCs (Figure 4A). Furthermore, PA significantly increased mitochondrial reactive oxygen species (ROS), assessed by MitoSOX Red staining, in autophagy-deficient PTCs but not in autophagy-competent PTCs (Figure 4B). PA significantly decreased mitochondrial DNA/nuclear DNA (mtDNA/nDNA) ratios, which was more pronounced in autophagy-deficient PTCs than autophagy-competent PTCs (Figure 4C). Consistent with these observations, PA decreased cell survival of both PTCs, which was prominent in autophagy-deficient PTCs (Supplemental Figure 4A). PA significantly decreased mRNA of mitochondrial oxidative phosphorylation gene in both autophagy-competent and -deficient PTCs and increased mRNAs of FA β-oxidation genes in autophagy-competent PTCs but not in autophagy-deficient PTCs (Supplemental Figure 4B). These data suggest that PA places substantial stress on mitochondria, which is alleviated by autophagy. PA-induced mitophagy protects PTCs from mitochondrial injury. (A and B) The mitochondrial membrane potential (A) and the mitochondrial ROS (B) of autophagy-competent and -deficient PTCs treated with either 0.25% BSA or 0.25 mM PA for 12 hours were assessed by TMRE and MitoSOX Red stainings, respectively (n=4–6). Quantitative data of relative intensity were also provided. (C) The mtDNA copy number of autophagy-competent and -deficient kidney PTCs was quantified after treatment with either 0.25% BSA or 0.25 mM PA for 12 hours. (A–C) Values are normalized by the signal intensity of BSA-treated autophagy-competent PTCs. (D and E) PTCs stably expressing GFP-MAP1LC3 (D) or GFP-MAP1LC3 and mStrawberry-ubiquitin (E) were stained with MitoTracker Red FM (D) or MitoTracker Deep Red FM (E) after treatment with either 0.25% BSA or 0.25 mM PA for 6 hours (n=5). (D) Yellow dots in merged images represent colocalization of mitochondria and autophagosomes. Colocalization was assessed by Pearson correlation. (E) White dots in merged images represent colocalization of ubiquitinated mitochondria and autophagosomes. (F) Western blot analysis (PINK1, PARK2/Parkin, and COX4) (n=4). Actin, β (ACTB) was used as loading control. The mean value of untreated controls at the baseline was adjusted to “1” as a reference. Bars: 10 μm. Data are provided as mean±SEM. Statistically significant differences: *P<0.05 versus autophagy-competent cells of corresponding treatment; #P<0.05 versus BSA-treated control cells (A–C); *P<0.05 (D and E). Atg5(+), autophagy-competent PTC; Atg5(−), autophagy-deficient PTC. All images are representative of multiple experiments. We next examined whether PA induces autophagy to selectively eliminate impaired mitochondria (mitophagy). Staining mitochondria with MitoTracker Red FM in GFP-MAP1LC3–transfected PTCs demonstrated that more autophagosomes were colocalized with mitochondria in PTCs treated with PA than BSA (Figure 4D). Furthermore, to investigate whether ubiquitinated mitochondria were recognized as a target of autophagic degradation, we stained GFP-MAP1LC3 and mStrawberry-ubiquitin double-transfected PTCs with MitoTracker Deep Red FM. More autophagosomes were localized with mitochondria and ubiquitin when treated with PA than with BSA (Figure 4E). The phosphatase and tensin homolog-induced putative kinase 1 (PINK1) and Parkin RBR E3 ubiquitin protein ligase (PARK2/Parkin) pathway is critical in controlling mitophagy.32 Western blot analysis revealed that PA increased the expression levels of PINK1 and PARK2/Parkin but decreased level of cytochrome c oxidase subunit IV (COX4), which confirmed PA-mediated mitophagy induction and mitochondrial depletion (Figure 5M). Together, although causal relationship between autophagy deficiency and mitochondrial dysfunction remains to be examined, mitophagy could protect proximal tubules from PA-induced mitochondrial damage. Autophagy deficiency aggravates HFD-induced mitochondrial dysfunction and inflammation, leading to renal fibrosis. (A) PAS-stained kidney cortexes of nonobese and obese Atg5F/F;KAP mice and Atg5F/F control littermates (n=10–14 in each group). Magnified images are shown in the insets (original magnification, ×1000). (B–I) Electron micrographs of obese Atg5F/F (B–E) and Atg5F/F;KAP mice (F–I) (n=3 in each group). Arrow indicates the lysosome and asterisk indicates the nucleus. (J–N) Immunostaining for F4/80, a macrophage marker (J), mRNA expression levels of inflammatory cytokine- (K) and inflammasome- (L) related genes, Western blot analysis of NLRP3, caspase-1, IL-1β, and IL-18 (M), and immunostaining for F4/80 (green) and IL-1β (red) (N) in the kidney outer medulla of Atg5F/F;KAP and Atg5F/F control mice fed ND or HFD for 2 months. n=7–9 (J) and 6–7 (K–N) in each group. Bars: 50 μm (A and J), 10 μm (B, F and N), 5 μm (F and J), and 500 nm (C–E and G–I). Data are expressed as the fold change relative to the mean value of nonobese Atg5F/F mice. Values represent the mean±SEM. Statistically significant differences: *P<0.05 versus treatment-matched Atg5F/F control littermates; #P<0.05 versus nonobese mice. (N) Sections were counterstained with DAPI (blue). All images are representative of multiple experiments. F/F, Atg5F/F mice; F/F;KAP, Atg5F/F;KAP mice; M, mitochondria. We next examined the role of autophagy during lipid overload using PTC-specific Atg5-deficient mice (Atg5F/F;kidney androgen regulated protein [KAP] mice). Cytosolic vacuolar formation was almost completely resolved in obese Atg5F/F;KAP mice (Figure 5A). This remarkable finding confirms the in vitro data that PA-induced autophagy is involved in shuttling FL HPC from cellular membranes into lysosomes where phospholipids accumulate (Figure 2, A–D). In the kidneys of obese Atg5F/F control littermates, massive lysosomal accumulations containing multilamellar, onion skin-like structures indicative of phospholipids were confirmed (Figure 5, B and C), whereas mitophagy was occasionally observed (Figure 5D) and there was no remarkable morphologic change in the mitochondria (Figure 5E). In contrast, we found massive aggregation of fragmented and swollen mitochondria with derangement of the cristae in obese Atg5F/F;KAP mice, although no remarkable morphologic change in lysosomes was observed (Figure 5, F–I). COX and succinate dehydrogenase (SDH) staining were performed to evaluate HFD-induced alterations in mitochondrial respiration activity. PTCs of nonobese Atg5F/F;KAP mice showed less intense COX and SDH staining than those of nonobese controls (Supplemental Figure 5, A and B). Tubular COX and SDH staining was somewhat decreased in obese Atg5F/F control littermates compared with nonobese Atg5F/F control littermates; however, a more prominent decline in COX and SDH staining was observed in obese Atg5F/F;KAP mice. We found increased staining for oxidative stress markers, including 4-hydroxy-2-nonenal (HNE), dityrosine, and N-carboxymethyl lysine (CML), in obese Atg5F/F;KAP kidneys (Supplemental Figure 5C). Nonobese Atg5F/F;KAP mice exhibited patchy macrophage infiltration into the outer stripe of the outer medulla, which was significantly exaggerated by HFD (Figure 5J). This macrophage infiltration was associated with change in the levels of mRNA expression of inflammatory cytokines TNFα, chemokine CC motif ligand 2 (CCL2), and CCL3, as well as inflammasome-related molecules nod-like receptor, pyrin containing 3 (NLRP3); apoptosis-associated speck-like protein containing; and caspase-1 (Figure 5, K and L). Western blot analysis (NLRP3, caspase-1, IL-1β, and IL-18) confirmed HFD-induced inflammasome activation (Figure 5M). Obese Atg5F/F control mice showed increased expression of IL-1β in F4/80-positive macrophages, which was significantly exaggerated by autophagy deficiency (Figure 5, M and N). Additionally, to investigate the long-term consequences of HFD-induced lipotoxicity, we observed Atg5F/F;KAP mice fed a HFD for up to 10 months. Obese Atg5F/F;KAP mice exhibited severe brush border loss, tubular dilation, cast formation, enhanced macrophage infiltration, and interstitial fibrosis (Supplemental Figure 6, A–C). 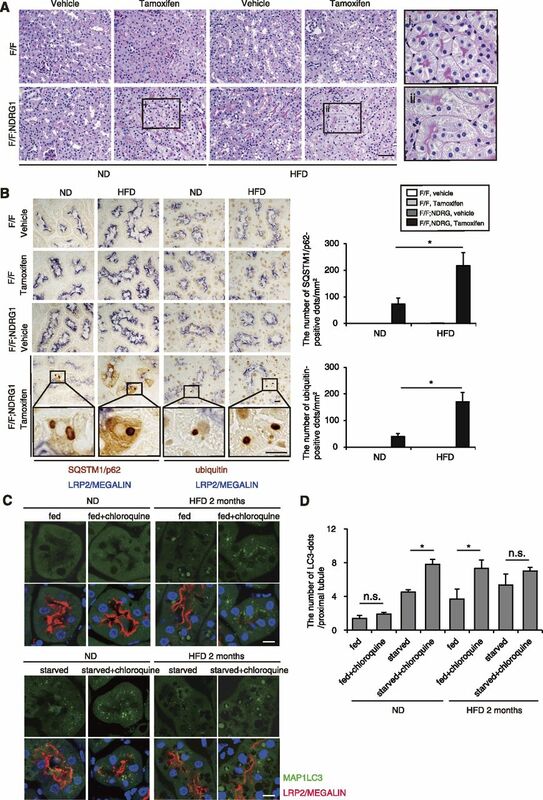 Collectively, autophagy protects kidney PTCs from HFD-induced reduction in mitochondrial function, suppresses macrophage infiltration and inflammasome activation, and slows HFD-induced renal fibrosis. We exposed mice to ischemia-reperfusion (I/R) injury to determine whether HFD-induced chronic lipotoxicity leads to vulnerability to ischemic and/or oxidative stresses. More severely injured tubules with massive tubular sediments and vacuolation were observed in I/R-injured obese Atg5F/F mice compared with I/R-injured nonobese Atg5F/F mice (Figure 6A). The number of apoptotic, terminal deoxynucleotidyl transferase–mediated digoxigenin-deoxyuridine nick-end labeling (TUNEL)-positive tubular cells markedly increased in obese Atg5F/F mice after I/R injury (Figure 6B). These injuries were significantly exacerbated by autophagy deficiency. Renal function data, as assessed by plasma urea nitrogen and creatinine, verified the morphologic results, although not statistically significant presumably because mice were subjected to unilateral (not bilateral) I/R injury (Figure 6C). HFD enhances the vulnerability against I/R injury to autophagy-deficient mice. (A and B) Representative images of PAS-staining (A) and TUNEL staining (B) on kidney cortexes of nonobese and obese Atg5F/F;KAP mice and Atg5F/F control littermates 2 days after unilateral I/R injury or sham operation. (A) The tubular injury score was shown. (B) The number of TUNEL-positive PTCs was calculated in at least ten high-power fields (original magnification, ☓400). Bars: 500 μm. (C) Plasma urea nitrogen and creatinine were measured (n=6–8 in each group). Values represent the mean±SEM. Statistically significant differences: *P<0.05 versus treatment-matched Atg5F/F control littermates; #P<0.05 versus nonobese mice; ‡P<0.05 versus sham-operated mice. F/F, Atg5F/F mice; F/F;KAP, Atg5F/F;KAP mice. Kidney biopsy samples taken from obese and nonobese patients with various CKDs (n=5, respectively) were analyzed (Figure 7, A and B). Clinical characteristics of these patients are shown in Supplemental Table 1. All patients showed overt proteinuria. PTCs of all obese patients exhibited cytosolic vacuolar formation (Figure 7A). The margins of the vacuoles were positive for LAMP1. SQSTM1/p62 accumulation was observed in the PTCs from all these obese patients. In contrast, the LAMP1-positive vacuoles or SQSTM1/p62-positive aggregates were rarely observed in the nonobese patients. The vacuoles observed in the PTCs of patient 2 were positively stained with toluidine blue (Figure 7B). Electron microscopy from patient 4 (Figure 7, C–M) revealed that the vacuoles contain multilamellar, onion skin-like structures (Figure 7, F–K). A massive vacuolization containing undigested proteins and organelles (Figure 7L), and aberrant and degenerated mitochondrial morphology (Figure 7M) were also observed in the PTCs. These data suggest that phospholipid accumulation in the enlarged lysosomes and impaired autophagic flux were recapitulated in the kidneys of obese patients. Phospholipid accumulation and impaired autophagic flux in the kidneys of obese patients. (A) Representative images of kidney specimens obtained from obese and nonobese patients with overt proteinuria (n=5, respectively). Kidney sections were immunostained for LAMP1 and SQSTM1/p62, and counterstained with hematoxylin. Magnified images are shown in the insets (original magnification, ×1000). (B) Representative images of toluidine blue staining from obese patient 2 (original magnification, ×1000). (C–M) Representative images of electron micrographs from obese patient 4. A lysosome with normal morphology is shown (D and E). Magnified images of lysosomes are presented (original magnification, ×3000). Bars: 50 μm (A and B), 5 μm (C, F, and I), and 500 nm (D, E, G, H, J–M). Arrows indicate the lysosome and asterisks indicate the nucleus. BM, basement membrane; M, mitochondria; TL, tubular lumen. In this study, we found a close association between autophagy and lipotoxicity in the kidney proximal tubule, as (1) lipid overload stimulates autophagy; (2) elevated autophagy plays a crucial role in counteracting lipotoxicity through mitochondrial quality control; (3) long-term lipid overload and subsequent autophagic activation places a burden on the lysosomal system, resulting in phospholipid accumulation and inadequate acidification; (4) lysosomal dysfunction, in turn, stagnates autophagic flux, which can lead to vulnerability to I/R injury; and (5) some of these findings are recapitulated in patients with obesity-related nephropathy. We are convinced that our findings are novel and clinically important to elucidate a molecular mechanism of lipid overload-mediated kidney injury. Then, what triggers lipid overload-induced autophagy independent of mTOR activation? What is degraded by lipid overload-induced autophagy? We found that mitochondria are a putative substrate. Indeed, other groups have previously reported the close association of mitochondria and lipid excess. High levels of FFAs evoke mitochondrial DNA (mtDNA) damage and impair mitochondrial dynamics and morphology in INS1 cells.39,40 FFAs modulate mitochondrial ROS production by several mechanisms, such as interaction with components of the respiratory chain, thereby inhibiting the electron transport.41 Our observation that PA significantly increased mitochondrial ROS and decreased mitochondrial membrane potential in autophagy-deficient PTCs, both of which could trigger mitophagy,42 suggests that autophagy could be triggered to target dysfunctional mitochondria during lipid overload. Indeed, PA-induced mitophagy has been recently reported in human aortic endothelial cells.43 In keeping with suppressed mitochondrial bioenergetics, we found a time-dependent decrease in cellular ATP levels in PTCs treated with PA, which may explain the impairment of lysosomal acidification, as H+ pump activity is highly sensitive to decreases in ATP concentration.44 Collectively, our findings demonstrate that, during lipid overload, PINK1-PARK2/Parkin–mediated mitophagy continues to protect proximal tubules from increasing mitochondrial stress; however, persistent mitophagy inevitably places a burden on the lysosomal system (as manifested by impaired acidification and phospholipids accumulation), leading to impaired autophagic flux. 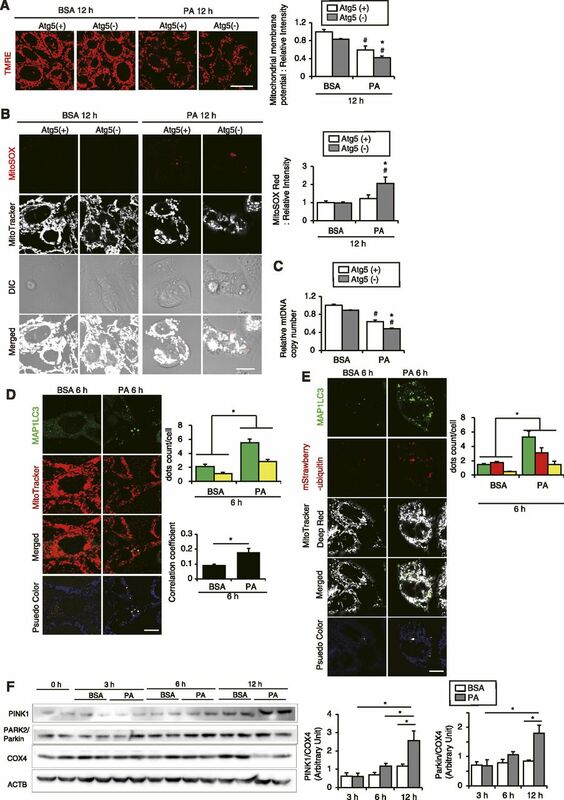 It has been previously reported that HFD-mice have proximal tubule injury with enlarged LAMP1-positive lysosomes containing phospholipids as multilaminar inclusions.26 In addition, a significant increase in the levels of specific glomerular and tubular lipid species, including phospholipids, has been recently reported in diabetes.45 Our study confirmed these findings, not only in HFD-loaded mouse kidney, but also in the clinical setting (obesity-related nephropathy). Although lipotoxicity in organs that have evolved specialized lipid handling functions has been generally attributed to FFAs and/or triglyceride accumulation, in our study, phospholipid accumulation has emerged as being central to lipotoxicity in the kidney. The origin of phospholipids appears to be the mitochondrial membrane. Phospholipids play an important role in cellular homeostasis by engagement in various cellular signaling pathways.46 However, the mechanism underlying the accumulation of undigested phospholipids in the lysosome during lipid overload and consequent alterations in cellular function remain to be elucidated. 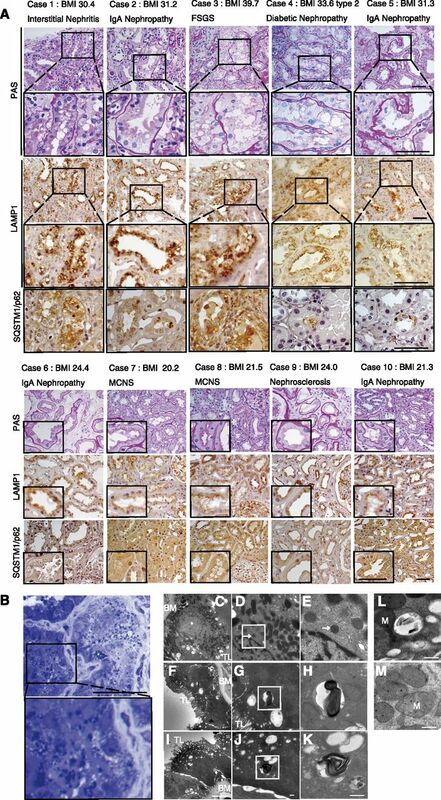 We have previously demonstrated that autophagy deficiency exacerbates kidney injury in many mouse models. In this study, we demonstrated that impairment in autophagic activity is observable in patients as well as genetically engineered mice. Although largely overlooked and not fully understood relative to the process of phagophore formation, the mechanism through which autophagosomes fuse with lysosomes is a critical aspect of macroautophagy. Similar to this study, we have previously observed that, in the aged kidney, basal autophagic activity is enhanced to cope with increasing “garbage” with age, but upregulation of autophagic flux in response to additional stress is blunted partly through lysosomal dysfunction (e.g., lipofustin).25 In other words, aging and lipid overload have a common mechanistic platform, lysosomal dysfunction, and consequent impaired autophagic flux. The interesting observation that may strengthen the close mechanistic relationship between aging and lipid overload are that caloric restriction potentially promotes longevity in many mammalian models,47 whereas high-fat and/or -carbohydrate diets accelerates aging.48 Furthermore, ischemic injury in the elderly and patients with hyperlipidemia is a major risk factor for ESRD.49,50 In this point, therapeutic effort to restore lysosomal function and autophagic flux will pave the way to improving the clinical outcome of kidney injury related to aging or HFD. The NLRP3 inflammasome senses obesity-associated danger signals, such as intracellular ceramide-induced caspase-1 cleavage, in macrophages and adipose tissue and contributes to obesity-induced inflammation and insulin resistance.51 In another report, PA stimulation results in AMP-activated protein kinase inhibition, leading to defective autophagy in myeloid cells, which activate inflammasomes.52 In addition, inflammasome activation in hematopoietic cells impairs insulin signaling in several target tissues to reduce glucose tolerance and insulin sensitivity.52 In this study, we extend these previous observations to the kidney and have demonstrated that HFD-induced impaired autophagic flux evokes macrophage infiltration and inflammasome activation, followed by renal fibrosis. It remains to be elucidated whether lipid overload-induced inflammasome activation could lead to reduced glucose tolerance and insulin sensitivity. In conclusion, we report that HFD-induced elevation in autophagy plays a crucial role in counteracting lipotoxicity in the kidney through mitochondrial quality control. Furthermore, a reduced capacity for upregulation of autophagic flux is associated with HFD-induced vulnerability to I/R injury. Strategies aimed at modulating autophagy hold promise for treating obesity-related kidney disease. GFP-MAP1LC3 transgenic mice and Atg5F/F;NDRG1 and Atg5F/F;KAP mice on a C57BL/6 background have been described previously.20,25,27 We used two different mice models, tamoxifen-inducible (Atg5F/F;NDRG1) and conditional (Atg5F/F;KAP) PTC-specific autophagy-deficient mice; Atg5F/F;NDRG1 mice were used only for the experiment assessing HFD-mediated changes in demand and activity of basal autophagy because using corn oil to dissolve tamoxifen could modify HFD-mediated changes such as metabolic profiles, and Atg5F/F;KAP mice were used for most of the experiments for evaluating the effects of autophagy deficiency during lipid overload. Atg5F/F;KAP mice were generated by crossing KAP-Cre transgenic mice, in which Cre recombinase is expressed under control of the KAP gene promoter, and mice bearing an Atg5 flox allele (Atg5F/F mice). KAP-Cre/CAG-CAT-Z male mice, in which β-galactosidase expression reflects Cre activity, exhibited LacZ-positive tubules in the cortex and the outer medulla, whereas LacZ-positive tubules were absent in female mice.20 Therefore, only male mice were used in this study. Eight-week-old mice were housed in box cages, maintained on a 12-hour light/dark cycle, and fed an ND (12.8% of kilocalories from fat: 5% fat, 23% protein, and 55% carbohydrate) or HFD (62.2% of kilocalories from fat: 35% fat, 23% protein, and 25% carbohydrate) (Oriental Yeast, Tokyo, Japan) for 2 or 10 months. For the induction of Atg5 deletion in Atg5F/F;NDRG mice, we intraperitoneally injected tamoxifen (Sigma-Aldrich, St. Louis, MO) (1 mg/10 g body wt) dissolved in corn oil (Sigma-Aldrich) at a concentration of 10 mg/ml three times every other day. In the experiment assessing the autophagic flux in vivo, chloroquine (Sigma-Aldrich; 50 μg/g body wt) was injected intraperitoneally and mice were euthanized 6 hours after the injection. We used the following antibodies: antibodies for LRP2/MEGALIN (a gift from T. Michigami, Department of Bone and Mineral Research, Osaka Medical Center and Research Institute for Maternal and Child Health, Osaka, Japan), COL1A1 (Abcam, Inc., Cambridge, MA), ATG5 (MBL, Nagoya, Japan), SQSTM1 (MBL), ubiquitin (Cell Signaling Technology, Danvers, MA), MAP1LC3 (Cell Signaling Technology), IL-1β (Cell Signaling Technology), IL-18 (Abcam, Inc.), NLRP3 (Adipogen, Seoul, Korea), caspase-1 (Santa Cruz Biotechnology, Santa Cruz, CA), PINK1 (Abcam, Inc.), PARK2/Parkin (Cell Signaling Technology), COX4 (MBL), phosphorylated ribosomal protein S6 (Ser235/236; Cell Signaling Technology), ACTB (Sigma-Aldrich), F4/80 (AbD Serotec, Oxford, UK), LAMP1 (BD Biosciences, San Jose, CA), 4HNE (Japan Institute for the Control of Aging, Fukuroi, Japan), dityrosine (Japan Institute for the Control of Aging), CML (Transgenic, Kobe, Japan), biotinylated secondary antibodies (Vector Laboratories, Burlingame, CA), horseradish peroxidase-conjugated secondary antibodies (DAKO, Glostrup, Denmark), and Alexa Fluor 555- and Alexa Fluor 488-conjugated secondary antibodies (Invitrogen, Carlsbad, CA). Histologic analysis was performed as previously described, with modification.25 To examine the number of GFP-positive dots, postfixed frozen kidney was sectioned and immunostained for LRP2/MEGALIN (PTC maker). The number of GFP-MAP1LC3 dots per proximal tubule were counted in at least ten high-power fields (×600) (each high-power field contained 10–15 proximal tubules). The fluorescence images were collected using confocal microscopy (FV1000-D; Olympus, Tokyo, Japan). Immunohistochemical staining for SQSTM1/p62, ubiquitin, COL1A1/collagen type I, HNE, dityrosine, CML, and IL-1β was performed on paraffin-embedded sections after antigen retrieval via autoclaving in 0.01 mM citrate buffer (pH 6.0) for 10 minutes at 120°C and blocking with 1.5% BSA (Sigma-Aldrich) in PBS for 60 minutes. Immunohistochemical staining for F4/80 (or double staining for F4/80 and IL-1β) was performed on paraffin-embedded sections after enzyme pretreatment using proteinase K solution (20 μg/ml) in TE buffer (10 mM Tris-HCl [pH 8.0], 1 mM EDTA) for 3 minutes at room temperature. For double staining for SQSTM1 (or ubiquitin) and LRP2/MEGALIN, each molecule was first visualized using a horseradish peroxidase-DAB compound (Nichirei, Chuo-ku, Tokyo, Japan), after detection of LRP2/MEGALIN using alkaline phosphatase and nitro blue tetrazolium and 5-bromo-4-chloro-3-indolyl phosphate Stock Solution (Roche Diagnostics, Basel, Switzerland). The percentage of the immune-positive area for COL1A1/collagen type I (or F4/80) was calculated using a digital image-analyzing software, ImageJ (available at http://rsbweb.nih.gov/ij/index.html; National Institutes of Health). For each kidney, at least ten high-power fields (×400) were analyzed. For electron microscopy, kidney specimens were fixed with 2.5% glutaraldehyde (Wako, Osaka, Japan) and observed using a Hitachi H-7650 transmission electron microscope (Hitachi, Tokyo, Japan). Characterization of tubular vacuole accumulation was performed using the toluidine blue staining on 4% paraformaldehyde (PFA)-fixed paraffin-embedded sections and using the Nile Red staining (Wako) on 4% PFA-fixed frozen sections. In all quantitative or semiquantitative analyses of histologic staining, at least ten high-power fields were reviewed for each tissue by two nephrologists (T.Y. and A.T.) in a blinded manner. Sections (5 μm thick) of frozen, 4% PFA-embedded tissue were dried for 1 hour at room temperature and rinsed in PBS, and placed in 60% isopropylene for 1 minute. They were stained in 60% Oil Red O solution (100% solution: 0.3 g of Oil Red O [Sigma-Aldrich] dissolved in 100 ml of isopropylene) for 20 minutes at 37°C, placed in 60% isopropylene for 1 minute, and washed with PBS three times. Tissue sections were counterstained with hematoxylin. COX/SDH staining were performed as previously described.23 Briefly, we used fresh cryosections (5 μm thick) of kidney tissues. For COX staining, the sections were incubated in the solution composed of 2 μg/ml of catalase (Sigma-Aldrich), 1 mg/ml of cytochrome c (Sigma-Aldrich), and 0.5 mg/ml of diaminobenzidine (Wako) in 0.1 M of phosphate buffer (pH 7.4) for 1 hour at 37°C. The SDH staining was performed according to the modified method of Martin et al.53 In brief, we prepared nitro blue tetrazolium stock composed of KCN 6.5 mg (Nacalai, Kyoto, Japan), EDTA 185 mg (Sigma-Aldrich), and nitro blue tetrazolium 100 mg (Nacalai) in 100 ml of 0.1 M phosphate buffer (pH 7.6) and 500 mM of sodium succinate solution (Nacalai) diluted in distilled water. Then the sections were incubated in a solution mixed with 2 ml of nitro blue tetrazolium stock solution, 0.2 ml of succinate solution, and 0.7 mg of phenazine methosulfate (Nacalai) for 15 minutes at 37°C. The intensity of the positive staining area was measured using the imaging software, ImageJ. For each kidney, at least ten high-power fields (×400) were analyzed. Autophagy-deficient and autophagy-competent PTC lines were as previously described.20 In brief, Atg5-deficient kidney PTCs (Atg5-negative PTCs) were isolated from 3-week-old Atg5F/F;KAP mice and immortalized by using pEF321-T, an SV-40 large T antigen expression vector. As a control, we generated Atg5-positive PTCs by stably transfecting pMRX-IRES-Atg5-bsr (Atg5-expressing retroviral vector cassette) to Atg5-negative PTCs. We also isolated PTCs from wild-type mice and immortalized cell lines were established by transformation using pEF321-T, an SV-40 large T antigen expression vector. We transfected the pEGFP-MAP1LC3 vector (a gift from T. Yoshimori, Department of Genetics, Osaka University) to the wild-type PTC lines and then constructed GFP-MAP1LC3 transgenic PTC lines. Cells were cultured in DMEM (Sigma-Aldrich) containing 5% FBS at 37°C under a humidified atmosphere of 5% CO2 and 95% air. Lipid-containing media (PA-BSA) were prepared by conjugation of PA with essentially FA-free, low endotoxin BSA (Sigma-Aldrich). Sodium palmitate (Sigma-Aldrich) were dissolved in 50% ethanol and vigorously mixed with BSA in PBS at a molar ratio of 6.6:1,54 filter-sterilized, and added to culture media at the final FA (PA) concentration of 0.25 mM. In this experimental condition, the BSA concentration was 2.5 mg/ml, or 37.88 μM. This concentration of FFA was used because the molar ratio of FFA to albumin could reach up to 8.59,55 and the albumin concentration in the proximal tubular lumen could be as high as 2.9 mg/ml, or 43 μM.56 Twenty-four hours after the seeding, the cells were treated with PA-BSA or 2.5 mg/ml BSA for 6–24 hours before harvest or analysis. According to previous studies, we used 2.5 mg/ml BSA treatment as a control for 0.25 mM PA treatment because it has been reported that, at a higher concentration, FA-free BSA has several cytotoxic effects, including ROS production, mitochondrial damage, and endoplasmic reticulum stress,57,58 all of which could induce autophagy and apoptosis in the PTCs.59 To assess autophagic activity, PTCs were treated with 200 nM of bafilomycin A1 (Wako) for 1 hour at 37°C before harvest. To assess autolysosome/lysosomal acidification, PTCs stably expressing GFP-MAP1LC3 were stained with 50 nM LysoTracker Red DND-99 (Invitrogen) for 30 minutes at 37°C. Colocalization of autophagosomes and lysosome was calculated using ImageJ. The lysosomal acidification was determined by staining with 1 μM of LysoSensor Yellow/Blue DND-160 (PDMPO) (Invitrogen) for 1 minute at 37°C. The fluorescence images were collected at the wavelength range from 510 to 641 nm (yellow) and at the wavelength range from 404 to 456 nm (blue) with the Olympus FV1000-D (Olympus). The mean fluorescence intensity in the fluorescence-positive area was measured using ImageJ, for yellow and blue fluorescence, respectively. The blue/yellow ratio was calculated by division process in each section. The average blue/yellow ratio of a given sample was calculated from five sections. Intensity was measured using at least three independent experiments (>150 cells per experiment). Fluorescence FA pulse-chase assay was performed as previously described, with slight modification.60 PTCs were incubated with DMEM with 5% FBS containing 2 μM β-BODIPY FL C12-HPC (FL HPC) (Invitrogen) for 16 hours. Cells were then washed three times with DMEM with 5% FBS, incubated for 1 hour to allow the fluorescent lipids to incorporate into cellular membranes, and then chased for the indicated times under PA-BSA treatment or 0.25% BSA treatment. FL-HPC–loaded and chased PTCs were stained with 50 nM LysoTracker Red DND-99 for 30 minutes at 37°C or stained with 25 nM of MitoTracker Red FM (Invitrogen) for 15 minutes at 37°C immediately before imaging, or fixed with 4% PFA for 15 minutes at room temperature for immunocytochemistry. The number and size of phospholipid/lysosome-merged dots were measured using ImageJ “analyze particles” function in threshold images. Cells cultured on 35 mm glass-bottomed dishes were subjected to the confocal analysis. The mitochondrial membrane potential was determined by staining with 50 nM of TMRE (Invitrogen) for 30 minutes at 37°C. To determine mitochondrial ROS production, cells were incubated with 0.3 μM MitoSOX Red (Invitrogen) for 10 minutes. The fluorescence images for TMRE or MitoSOX Red were collected using the Olympus FV1000-D (Olympus), and the mean fluorescence intensity in the fluorescence-positive area was measured using ImageJ. The average mean fluorescence intensity of a given sample was calculated from five sections. Intensity was measured using at least three independent experiments (>150 cells per experiment). ATP was measured using ATP Colorimetric/Fluorometric Assay Kit (BioVision, Inc., Milpitas, CA) according to manufacturer’s instruction. Assessment of mitophagy were performed as previously described.23 To prove mitophagy, PTCs stably expressing GFP-MAP1LC3 were stained with 25 nM of MitoTracker Red FM for 15 minutes at 37°C. Colocalization of autophagosomes and mitochondria was calculated using ImageJ and represented as Pearson correlation between fluorescence of GFP and MitoTracker Red FM. We also constructed GFP-MAP1LC3 and mStrawberry-ubiquitin double-transfected PTCs to assess the association between ubiquitin and mitophagy. GFP-MAP1LC3 and mStrawberry-ubiquitin double-transfected PTCs were stained with 25 nM of MitoTracker Deep Red FM (Invitrogen) for 15 minutes at 37°C. Relative quantification of mtDNA copy numbers were performed as previously described.25 In brief, total DNA (mtDNA and nuclear DNA) was extracted from isolated proximal tubules with Wizard Genomic DNA Purification Kit according to the manufacturer’s instruction (Promega, Madison, WI). Real-time quantitative PCR of the mtDNA-encoded gene mt-Co1 (GenBank accession no. NC_001807) and the single-copy nuclear gene Ndufv1 (NADH dehydrogenase [ubiquinone] flavoprotein 1) (GenBank accession no. NM_133666) was carried out with an ABI PRISM 7900HT sequence detection system (Applied Biosystems, Foster City, CA). Relative quantification of mtDNA copy numbers were depicted as the ratio of the relative concentrations of mtDNA/nDNA. The sequences of primers for the MT-CO1 and Ndufv1 gene are as follows: mt-Co1-F, 5′-tgctagccgcaggcattac-3′; mt-Co1-R, 5′-gggtgcccaaagaatcagaac-3′; Ndufv1-F, 5′-cttccccactggcctcaag-3′; Ndufv1-R, 5′-ccaaaacccagtgatccagc-3′). MTS assays were performed using CellTiter 96 AQueous One Solution Cell Proliferation Assay (Promega), according to the manufacturer’s instructions, in a 96-well plate. Each experiment was performed in triplicate and repeated at least three times. Cell viability in percentage refers to the MTS value of the induced cells compared with the value of the untreated control cells (cultured in DMEM containing 5% FBS). Quantitative RT-PCR and Western blot analyses were performed as previously described.61 The sequences of the primers used were as follows: Cpt1-F, 5′-accactggccgaatgtcaag-3′; Cpt1-R, 5′-agcgagtagcgcatggtcat-3′; Aox-F, 5′-tcaacagcccaactgtgacttccatta-3′; Aox-R, 5′-tcaggtagccattatccatctcttca-3′; Scad-F, 5′-ttacctggcctactccatcg-3′; Scad-R, 5′-tgatccactgttgcttctgc-3′; Mcad-F, 5′-taatcggtgaaggagcaggttt-3′; Mcad-R, 5′-ggcatacttcgtggcttcgt-3′; Lcad-F, 5′-gcatcaacatcgcagagaaa-3′; Lcad-R, 5′-acgcttgctcttcccaagta-3′; Cox5b-F, 5′-aggcagcttcaggcaccaag-3′; Cox5b-R, 5′-ggtggggcaccagcttgtaa-3′; Tnfα-F, 5′-atggcctccctctcatcagt-3′; Tnfα-F -R, 5′-cttggtggtttgctacgacg-3′; Ccl2-F, 5′-cccaatgagtaggctggaga-3′; Ccl2-R, 5′-tctggacccattccttcttg-3′; Ccl3-F, 5′-tgcccttgctgttcttctct-3′; Ccl3-R, 5′-gatgaattggcgtggaatct-3′; Nlrp3-F, 5′-atgctgcttcgacatctcct-3′; Nlrp3-R, 5′-aaccaatgcgagatcctgac-3′; Asc-F, 5′-acagaagtggacggagtgct-3′; Asc-R, 5′-ctccaggtccatcaccaagt-3′; caspase-1-F, 5′-cacagctctggagatggtga-3′; caspase-1-R, 5′-tctttcaagcttgggcactt-3′; Sqstm1-F, 5′-ccccagagtcgaagtagctg-3′; Sqstm1-R, 5′-agtgagaagaggctggtgga-3′; Gapdh-F, 5′-aactttggcattgtggaagg-3′; Gapdh-R, 5′-acacattgggggtaggaaca-3′. Kidney ischemia was induced as previously described.20 In brief, the animals were anesthetized and were kept on a homeothermic table. For unilateral clamping, back incisions were made to expose the kidney pedicles to induce 35 minutes of kidney ischemia. The clamps were released for reperfusion. Control animals were subjected to sham operation without renal pedicle clamping. Kidney tubular cells of the cortex were examined by two nephrologists (T.Y. and A.T.) in a blind manner, and were scored from 0 to 10 according to the percentage of damaged tubules. Tubular damage was defined as cell necrosis, which was evaluated in this study by loss of brush border, tubular dilation, and cast formation. At least ten high-power fields (×400) were reviewed for each periodic acid–Schiff-stained slide. Plasma urea nitrogen and creatinine were measured using the BUN-Test-Wako (Wako), the CRE-EN Kainos (Kainos, Tokyo, Japan), respectively. Apoptotic cells were detected using the TUNEL assay with an in situ apoptosis detection kit (Takara, Kyoto, Japan). Tissue sections were counterstained with Methyl Green Solution (Wako) and examined under a microscope. Human kidney biopsy specimens were obtained from patients with overt proteinuria. All patients provided written informed consent. All results are presented as means±SEM. Statistical analyses were conducted using JMP software (SAS Institute Inc., Cary, NC). Multiple-group comparisons were performed using analysis of variance with post-testing using the Tukey–Kramer test. The difference between two experimental values was assessed by paired t test when appropriate. Statistical significance was defined as P<0.05. All animal experiments were approved by the institutional committee of the Animal Research Committee of Osaka University and the Japanese Animal Protection and Management Law (No.25). In the case of human studies, written informed consent was received from participants before inclusion in the study. T.Y., A.T., Y.T., and Y.I. were involved in study design and writing manuscript. The other authors and T.Y. performed experiments and analyzed data. All authors contributed to the discussions. We thank N. Mizushima, University of Tokyo, for Atg5F/F and GFP-MAP1LC3 mice; T. Michigami, Osaka Medical Center and Research Institute, for LRP2/MEGALIN antibody; and N. Horimoto and for technical assistance. This work was supported by a Grant-in-Aid for Scientific Research from the Ministry of Education, Culture, Sports, Science and Technology in Japan (15H06371 [to T.Y. ], 24591196 and 15K09260 [to Y.T. ], and 24659416 [to Y.I. ]), Takeda Medical Research Foundation (to Y.T. ), and Merck Sharp & Dohme (to Y.I.). T.Y. and Y.T. contributed equally to this work. This article contains supplemental material online at http://jasn.asnjournals.org/lookup/suppl/doi:10.1681/ASN.2016070731/-/DCSupplemental.